I am not, as a rule, a fan of green tomatoes. The first one I ever tried was at a well known New York deli. It was pickled. Or rather, half-sour pickled. And it was one of the worst things I’ve ever tasted. Maybe if it had been more sour, it would have tickled my fancy. But as it was, I’ve gone pretty far out of my way to avoid tomatoes that aren’t actually ripe. That is, until this year, and the little summer that couldn’t. I sadly pulled up my remaining tomato plants after the rains weren’t stopping, and picked the remaining green fruits. It was around this same time, I got a little treat in the mail… “Gifts Cooks Love: Recipes for Giving” (Sur La Table, Diane Morgan) from the publisher. Call it kismet, but there I was with a bucket full of green tomatoes and a beautiful book with a recipe to use them. Before jumping to the recipe, I want to tell you a bit about Gifts Cooks Love. This is a beautiful book. And why wouldn’t it be? It’s packed with Sara Remington’s stunning photography, and charming styling by Kim Kissling, Tina Stamos, Kerrie Sherrel Walsh and Lori Engels. There are jars and ribbons, boxes and bags, and most of all beautiful, giftable food. There are recipes for candies, crackers, preserves, sauces, liqueurs and even cured meats. But most of all, I find the book inspiring to take dishes I already love and make them into something special to give, even if you aren’t all that crafty. Now back to the green tomatoes and the chutney. Once you get through all the chopping, the chutney is easy to make. The ingredients stew for about 1 hour until the flavors meld. The flavors get even deeper and richer after storing for a week or so (I stored mine in the fridge rather than truly canning it). The chutney is sweet and savory, with a nice little kick from the jalapenos. Serve it up with some crackers or flat bread, and you have a fantastic appetizer. To enhance the color, instead of using yellow onion and apples, as the recipes recommends, I used red onions and quince, which turns rosy after stewing. The color still wasn’t quite as bright as I was hoping, but the flavors make up for it. In a large heavy bottom pot, combine the tomatoes, red onion, quince, garlic, vinegar, brown sugar, honey, mustard seeds, salt and allspice, and bring to a boil. Reduce heat and simmer for 30 minutes, stirring on occasion to prevent browning on the bottom of the pan. Add the jalapeno and currants, and stew for another 30 minutes. Taste for salt and sweetness and adjust if needed before canning. This entry was posted in Cook and Eat, Cookbooks, Food, Recipe, Savory, Side, Sweet. Bookmark the permalink. This is my mom’s favorite! She is quite a fan of chutneys and is really like it with crackers! if my mom sees this, she’ll definitely take over the computer! LOL. It is great to see a recipe for this one though! I can make this as a surprise for my one and only mom! I am also a recent green-tomato-convert! I discovered this summer that they add a great tang to ordinary green salads. Use them along with red tomatoes for an interesting tang! This chutney looks YUM. Can’t wait to try it! I am a fan of green tomatoes. 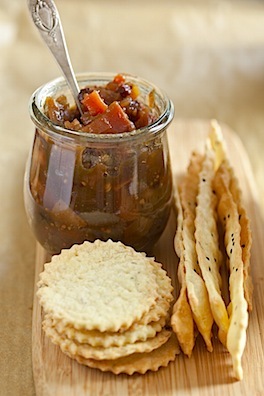 But not a fan of chutneys… However, you did make it look and sound like a great thing to try! Ohh your pictures are amazing! Was I just staring down 15 green tomatoes this evening? Swear to goodness, you’re a fly on my wall. Mmm my mouth is watering, and I’m wishing that I had some green tomatoes to play with. oh my green tomatoes. isn’t it too sour for a chutney? 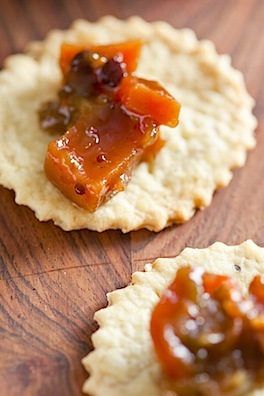 i love chutneys on crackers. but chutney made of green tomato? i don’t know maybe i’ll try this recipe for me to see. 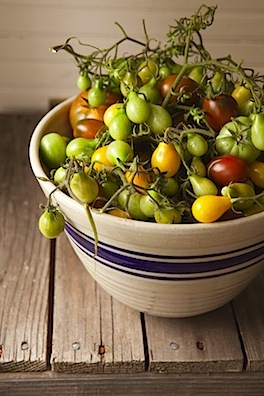 it’s time to use those unripe tomatoes on the garden. Just curious to know if the mixing bowl in the photograph is a piece of Friendship Pottery from Ohio? I have pieces similar and many others made by Henn Pottery? I enjoyed your blog. 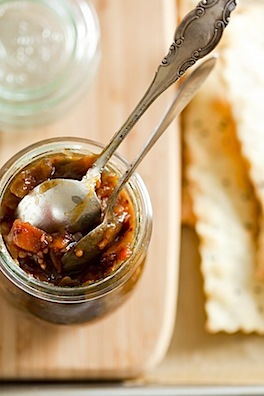 I made this chutney and it’s the best I’ve ever tasted! Thank you for the recipe. How long would I need to process this in a hot water bath for canning?